The hotel Vila Galé Náutico, located in the centre of Armação de Pêra and a few meters from the beach, was renovated in 2012 and is the ideal place for your holidays with the All-inclusive system. 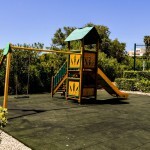 This "All-inclusive" hotel has a "navy" decor style and offers family rooms and suites fully renovated and adapted to families with children. This family hotel offers outdoor pools, playground, children’s club, a sports ground and Spa with indoor pool, Jacuzzi, gym and massage room. 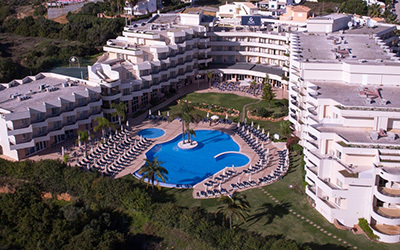 A lively bar, an international buffet restaurant and an Italian à la carte restaurant, complete the offer of this hotel in the Algarve. The hotel offers free Wi-Fi access in all areas. During your stay, be sure to enjoy the beach or stroll along the picturesque village of Armação de Pêra, with a wide range of restaurants, bars and shops. You can also make beautiful boat trips along the coast and visit the chapel of Nossa Senhora da Rocha. 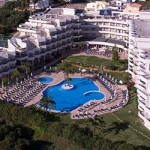 On holiday in the Algarve, also enjoy the theme parks such as Zoomarine, Aqualand and Aquashow. Vila Galé Náutico has a total of 233 bedrooms. 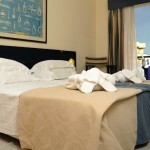 From these, we feature 25 junior suites suitable for families.